The world’s leading classification societies are continuing to improve safety standards and service levels for owners as they seek to attract more bulk carriers to their fleets. But some have more to gain than others, at least in terms of market share. ClassNK, for example, claims to class more bulk carriers in terms of both vessel numbers and gross tonnage than any other society in the world. As of the end of 2015, bulk carriers accounted for over 3,800 vessels totalling approximately 150 million gross tonnes (GT) registered with the society. “Over the past few years our registered fleet has continued to grow and become increasingly diversified, and whilst seeing significant increases in sectors such as LNG and tanker vessels we have also seen an increase in bulk carriers of over 5% from the end of 2014 to 2015,” said Mr Mitsuhiko Kidogawa, Director of Plan Approval Division. By contrast, DNV GL is better known for its prowess as a leading society outside of the bulk carrier sector. At the end of 2015, DNV GL had a total registered fleet of some 268.6 million GT of 12,740 vessels. However, just 869 ships in the fleet representing 39m GT in class were bulk carriers. This translated into just 7.7% of the society’s fleet in terms of vessel numbers and 9.3% in terms of GT. But DNV GL is keen to expand and is now taking steps to attract more owners. DNV GL expects its new rule set and involvement in joint industry projects to turn it into a technology leader in the bulk carrier segment, helping it build on its solid safety performance. ”Both port state control (PSC) statistics and Intercargo statistics shows that owners with bulk carriers classed by DNV GL fair better than those of any other class society,” claimed the spokesperson. One recent example of the strategy is the DNV GL Guideline on Cargo Liquefaction, published in 2015. The society has also used its Big Data and bulk carrier expertise to collect the resulting insights in its new publication Operational Experience for Bulk Carriers and has assisted designers and owners in developing new bulk carrier designs, which it claims offers greater cargo flexibility and energy efficiency. “Both the Green Dolphin 38 design for a Handysize bulk carrier and the design for the world’s first LNG-fuelled bulk carrier B.Delta26LNG are good examples of this,” said the spokesperson. bulk carriers. The vessels, ordered by the Finnish owner ESL Shipping and designed by Deltamarin, were also the first to be constructed to the new DNV GL rule set. Due for delivery in early 2018, the two highly efficient 25,600dwt vessels are optimized for trading in the Baltic Sea region where they will operate using LNG as ship fuel. 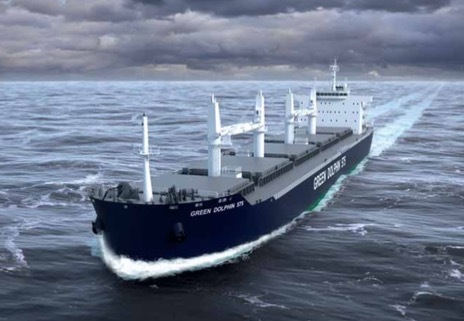 Class NK, like DNV GL, is also verifying new LNG-fuelled bulker designs. In November 2015 the society granted Approval in Principle (AIP) to a 98,000dwt LNG-fuelled bulk carrier design developed by Maritime Innovation Japan Corporation (MIJAC). The decision was reached after carrying out a safety evaluation of the vessel design verifying that the concept complies with the International Code of Safety for Ships using Gases or other Low flashpoint Fuels (IGF Code), which will come into effect from 1 January 2017, and ClassNK’s Guidelines for Gas Fuelled Ships. The concept includes a 2,000m3 capacity LNG tank (IMO Type B) and an LNG fuel supply system allowing the main engine and main generator engines to operate on dual fuel. ClassNK is also looking to buttress its position in the bulk carrier sector by further expanding and enhancing its global service network. ClassNK has now stationed Survey Department Representatives with decision-making authority in Singapore, Hamburg, and New York, which Kidogawa said had been major factor in increases in European, particularly German- owned vessels, on the society’s register. Bureau Veritas is investigating further opportunities related to the iron ore trade and Very Large Ore Carriers (VLOC) in a bid to expand its presence in the dry bulk carrier sector. However, due to the current stagnating new building market, the BV orderbook has decreased to 70 vessels and 3.3mGT, reflecting the shrinkage of the global orderbook. “Based on current market dynamics we don't expect a rebound of this market within 2016 while delivery deferrals and order cancellations are expected to continue,” he added. On the safety side, BV’s main focus for bulk carriers is on reducing the risks of cargo liquefaction and later this year the society is planning to introduce updated guidelines and requirements that will further help to tackle the risks of liquefaction. “The updated guidelines will be the outcome of common work performed together with designers and ship owners since liquefaction is both a design and an operational issue. We expect to publish our new guidelines during the last quarter of 2016,” he said. ClassNK is working with the shipping industry to help compliance with new SOLAS regulations that entered force on 1 July, 2016. The new rules apply to bulk carriers and oil tankers of 150 m in length and above contracted from 1 July 2016. In the absence of a building contract, the rules also apply to keels which are laid or which are at a similar stage of construction on, or after 1 July 2017, or ships due for delivery on or after 1 July 2020. The guidelines for SCF recommend that some high IP level drawings belonging to the shipyard be securely stored in an onshore archive centre like ClassNK’s ‘Archive Center’. Although not mandatory, Kidogawa said for shipowners an archive centre was now an essential service. “It is the pragmatic solution for complying with the new SOLAS regulation whilst protecting IP rights,” he said. The ClassNK Archive Center is certified according to the Information Security Management System requirements (ISO 27001) and satisfies the SCF Industry standard, developed in consultation with global cross industry group as described in IMO guidelines.